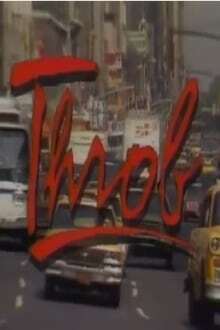 Throb is an American television sitcom broadcast in syndication from 1986 to 1988, created by Fredi Towbin. It revolved around thirty-something divorcee Sandy Beatty who gets a job at a small New Wave record label, Throb. Beatty's boss is Zach Armstrong, who looks like Michael J. Fox but dresses like Don Johnson. Beatty also has a 12-year old son named Jeremy. Beatty's best friend was Meredith, a single teacher who lived in her building, and her co-workers included hip business manager Phil Gaines, and Prudence Anne Bartlett, nicknamed Blue. During the second season, Sandy moved from her original apartment to the recently vacated penthouse in her building. She took in her co-worker, Blue, to help with rent, but the differences between straitlaced Sandy and the very free-spirited Blue became more pronounced as they both lived and worked together. Notably, it was the first time much of the American TV audience saw Jane Leeves, who later gained fame as Daphne Moon on Frasier. Also notable is the casting of a young Paul Walker, who played Jeremy Beatty for the first season. Walker became a leading man in Hollywood some 15 years later, particularly after his breakthrough role in The Fast and the Furious. Season 2 of Throb premiered on September 19, 1987. We don't have any reviews for Throb. We don't have enough data to suggest any TV shows based on Throb. You can help by rating TV shows you've seen.